PEX Full Port Ball Valves. PEX Ball Valves feature an in-line shut-off valve for PEX piping. This PEX fitting may be used with the stainless steel clamping system or the copper crimp ring system. 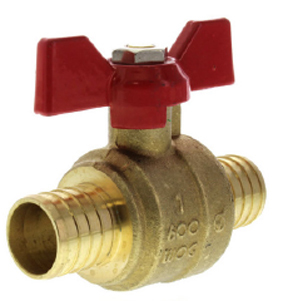 Features Valve Body Material Brass, Seats: Teflon (PTFE), Packing Nut, T-Handle Lead-Free, Inlet/Outlet Connections: 1” PEX, crimp/clamp style.